This month we covered some of the new features in FileMaker 16. Check out the recording of our monthly meeting below. The sample files used in this demo are available for download from https://community.filemaker.com/docs/DOC-8138. This link is supposed to be available to download, but there’s been an error popping up on that page about restricted access which you may experience. Looking for instructions for Windows? Click here! Let’s Encrypt is a non-profit certificate authority with the mission of spreading the SSL love across the internet. Though they’re not officially supported, we can use Let’s Encrypt to get free SSL certificates to use with FileMaker Server. We will use a Bash script and a LaunchDaemon to retrieve and automatically renew SSL certificates through Let’s Encrypt to make sure our connections to FileMaker Server are secure. With this, there’s no reason anyone should have an invalid SSL certificate on their FileMaker Server deployment! Marc Larochelle from Productive Computing presents about QuickBooks and FileMaker integration at our monthly meeting for May 2017. You’ll learn more about the world of QuickBooks Accounting, the various flavors available today and why customers are interested in connecting QuickBooks with FileMaker. We’ll explore the tools and skills needed to accomplish this as well as common integration strategies in use today. Then, we’ll take a deeper dive under the hood to see what a typical integration script looks like and how it all works from A to Z with FM Books Connector. After watching this webinar, you’ll know a lot more about how to get started with these integrations on your own and the right questions to ask a customer interested in making a connection between FileMaker and QuickBooks. You can purchase FM Books Connector from http://www.fmbooksconnector.com/. Nicholas Orr from Goya presented at our developer meeting this month. Watch the recording of the live-stream to see him demonstrate BaseElements and give a run down on the benefits of developer analysis tools in general, and BaseElements in particular. He’ll show you how to get the best solution possible from FileMaker using these tools, as well a quick demo of their update builder product : RefreshFM, Web Services server : RESTfm and the free BaseElements plugin. Looking for instructions for Mac? Click here! Let’s Encrypt is a non-profit certificate authority with the mission of spreading the SSL love across the internet. Though they’re not officially supported, we can use Let’s Encrypt to get free SSL certificates to use with FileMaker Server. We will use a PowerShell script and the Windows Task Scheduler on Windows Server 2012 R2 to retrieve and automatically renew SSL certificates through Let’s Encrypt to make sure our connections to FileMaker Server are secure. With this, there’s no reason anyone should have an invalid SSL certificate on their FileMaker Server deployment! Posted 11:55 am by David Nahodyl & filed under Atlanta FileMaker Developers, FileMaker. We had a special presentation at the Atlanta FileMaker Developers group meeting last night. Andy LeCates and Darrin Quick from FileMaker, Inc. came by to present some of the new features in FileMaker 14 and answer questions from the attendees. We live-streamed the event on YouTube and Hangouts On Air, where we also had some remote participants watching and asking questions. The recording of the live-stream is available on YouTube below. Posted 4:47 pm by David Nahodyl & filed under FileMaker. FileMaker is capable of importing data from many different sources. One of the most useful is importing from XML data sources, which can be a great way to get data from non-FileMaker resources into your database. 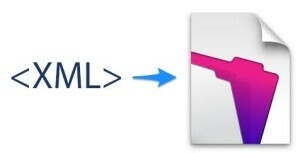 XML is used by all sorts of programs and applications, and so you may encounter it when working with many non-filemaker services or data sources.